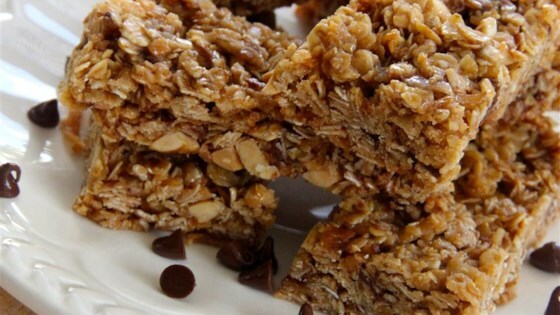 Spread the oats and coconut evenly across a baking sheet. Toast oats and coconut in preheated oven until browned, about 10 minutes; transfer to a large mixing bowl. Mix honey, peanut butter, vanilla extract, and salt in a saucepan over medium-low heat. Cook and stir until smooth. Pour the honey mixture over the oats and coconut; stir to coat. Spread the mixture evenly into the prepared baking dish. Bake in preheated oven until beginning to dry, about 15 minutes for crunchy granola bars, less if you like them chewy. Cool completely before cutting. Unbelievable! I added 1/3 cup of almonds and 1/3 cup of slivered almonds. Super easy to make. I added some mini chocolate chips and flax seeds - really good! I didn't have peanut butter and instead used Nutella. They came out pretty good. I like that these are chewy and not crispy granola bars.